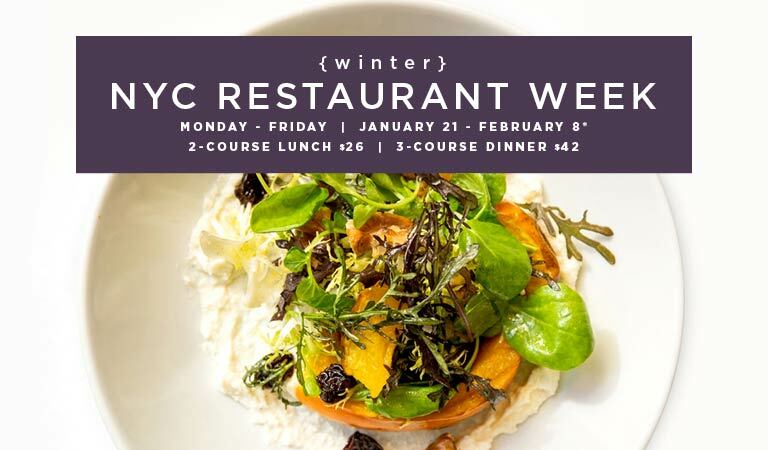 Get out of the cold at one of our New York City landmark locations for this year's Winter Restaurant Week! Join us for a $26 2-course lunch or a $42 3-course dinner. Indulge in delicious dishes like Fideos con Pato at La Fonda del Sol, Berkshire Pork Tenderloin at Rock Center Café, and Wild Mushroom Ravioli at STATE Grill & Bar. Treat yourself to refreshing dishes like the Marinated Shrimp Salad at The Sea Grill, Sunchoke & Black Truffle Soup at Stella 34, and the Garden Mezze at Yellow Magnolia Café; the perfect way to escape the cold. Inside the landmark MetLife Building lies this Parisian brasserie offering a menu of French favorites with a Mediterranean twist. The best-kept secret in Midtown! Yellow Magnolia Café offers modern, vegetable-focused cuisine in a one-of-a-kind setting nestled within Brooklyn Botanic Garden’s iconic landscape. Indulge in vibrant Spanish cuisine and an expansive selection of tapas at La Fonda del Sol. Signature items include Blistered Shishito Peppers, Patatas Bravas, and Ensalada del Sol. There is no shortage of house specialties to indulge in at this Midtown ristorante; enjoy Butternut Squash Ravioli, Pesce Milanese, or order a pizza to share. Located inside of Macy’s in Herald Square, Stella 34 Trattoria is a modern Italian restaurant showcasing al forno entrees, housemade pasta, authentic Neapolitan-style pizzas, and fresh salads. Steps away from Penn Station, Nick + Stef’s offers superb dry-aged cuts of beef, signature sides, and traditional steakhouse specialties. Brasserie 8 ½ is a stylish French brasserie located just steps from 5th Avenue. Enjoy beloved classics with a light, innovative touch. STATE Grill and Bar is an elegant restaurant located inside the iconic Empire State Building that offers classic American dishes made with seasonal ingredients with a touch of modern culinary style. Rock Center Café is an American grill serving a seasonally-updated menu along with house-crafted cocktails and New York’s top brews, overlooking the Summer Garden at Rockefeller Center. The Sea Grill in Rockefeller Center offers the highest-quality, freshest seafood prepared in impeccable style. Expect signature appetizers, freshly-shucked oysters and flawless sushi and sashimi. Chef Shea Gallante is bringing a new style of Italian food to Lincoln, refined and rustic, personal and classic.